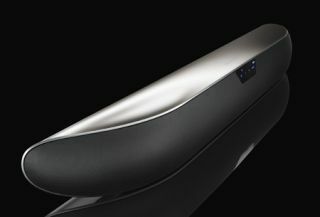 B&W gives its Panorama soundbar a makeover | What Hi-Fi? It's no secret that we weren't hugely impressed by the original B&W Panorama soundbar, but now there's a replacement in the form of the £1650 Panorama 2. B&W says it offers "dramatically improved acoustic performance" over the original model and – praise be! – the new one gets HDMI connectivity with three HDMI inputs and one HDMI out. There's also a new proximity-sensing control panel and enhanced user interface. Designed to boost the sound of your flatscreen TV, the Panorama 2 features completely new B&W drive units. There are nine in total, with five used in the active centre speaker: two bass woofers, two midrange drivers and an aluminium dome tweeter with B&W's Nautilus tube-loaded technology. The other four drive units provide the rest of the surround sound effects, and all are driven by six Class D amplifiers with a combined power output of 175W. Digital Signal Processing (DSP) is used to create a pseudo-surround effect from a single speaker unit, and a subwoofer such as the B&W PV1D can be added to further enhance the bass. A close proximity sensor activates the display on the Panorama 2 when the user's hand gets close, otherwise it remains off. Those extra HDMI inputs mean a Blu-ray player or games console can also be connected to the soundbar.